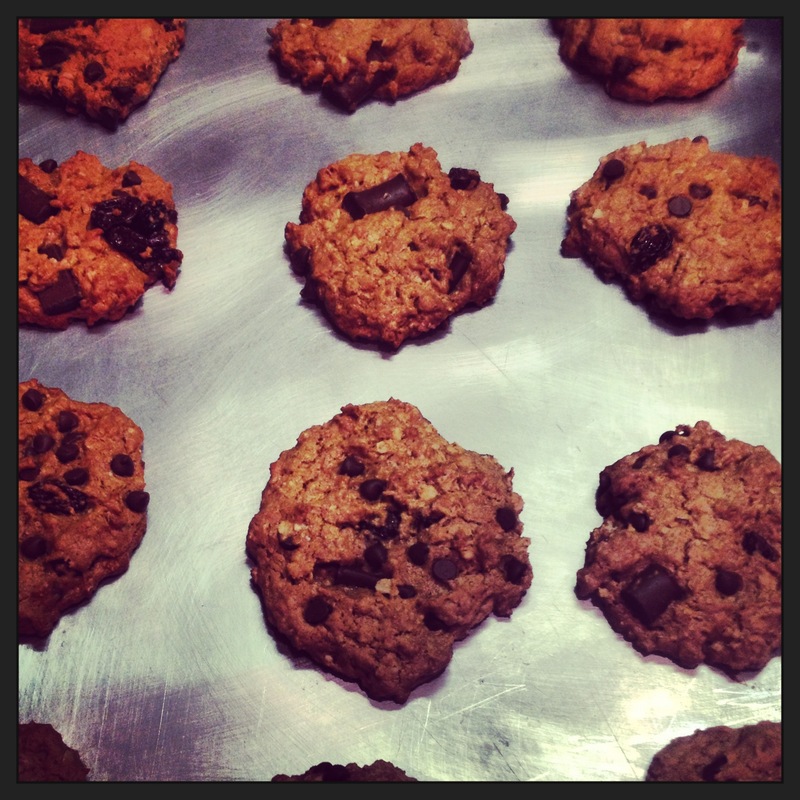 New This Week: Vegan Baking! So this week I did something that I’ve been wanting to do for the last four months: I tried some vegan baking and overall I was happy with how it went, especially considering I pretty much have no baking experience, vegan or not. As you’ll see, my level of enthusiasm is no where near Scott’s. Surprising, I know. Anyhow, my culinary adventures started on Sunday when I made some Chocolate Ginger Scones. They were okay, not great, so I won’t bother sharing that one with you. Scott scored it a 6.1 on a scale of 10. He said they were “a little dry probably because there were no eggs or butter.” Later in the week I made cookies and then also a blueberry cheesecake, both of which I really liked a lot. However, when I asked Scott what he thought about the cookies, he ranked them only a 6.7 (out of 10 – which surprised me – I really thought he liked them more than that). And sadly he said the cheesecake was only a 5.8. He claimed it had a film on it but that the crust was good. Personally I rank both the cookies and the cheesecake a solid 8.5/9 and I would make both of them again. When I asked Scott if I should continue to work on my vegan baking he semi-enthusiastically said yes. I told him that he didn’t even like anything I made, that he gave me failing scores on everything: a 67, a 61, and a 58! When he realized how harsh he apparently was, he said he’d give me a 70 across the board because it was “good for the first time.” Ha! So don’t take his word for it, take mine. If you want to try making vegan desserts, the two recipes below are definitely worth trying. Pre-heat oven to 350 degrees. In a food processor, combine the graham cracker crumbs and margarine. Pulse until the mixture starts to clump, is sandy, and starts to stick together. Lightly grease a spring form pan (although I just used a regular pie pan), and pour graham cracker crust into the center of the pan. Use your hands to spread and press the crust to the pan, forming it up 2 inches around the sides (if using spring form pan; if not, I went ahead and went all the way up the lip of the pie pan). Set aside. Clean out your food processor. Then, combine both containers of cream cheese, tofu, sugar, salt, and vanilla. Process on high for one minute. Scrape the sides, to ensure it is being well combined. Then, add xanthan and baking soda, and process again for 30 seconds. Next, drop in the blueberries from the top while the processor is still going. 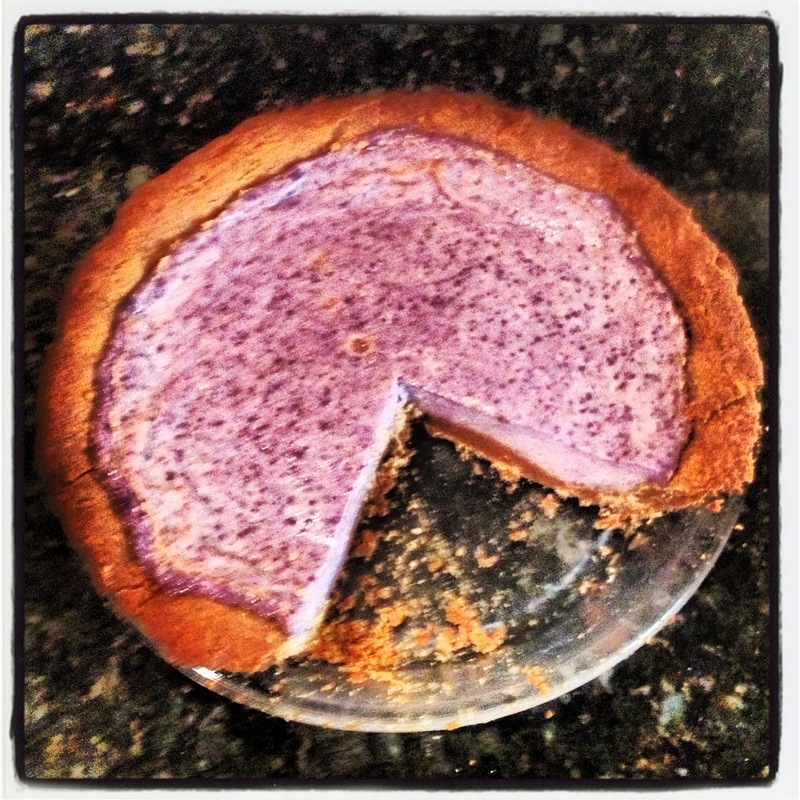 Once a beautiful purple hue is achieved, and all ingredients are properly mixed, pour the filing into the crust and gently spread evenly with a spatula. Leave a little bit of room as it will rise some. Bake for 25-30 minutes, until top of filling and crust is golden. Set in refrigerator to settle and cool for at least an hour. Garnish with fresh blueberries, cream cheese frosting, or cashew cream. Serve cold.